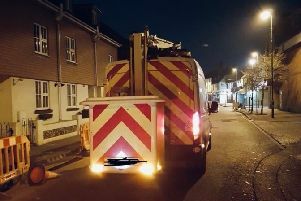 A teenager charged with stabbing two people and injuring another in Littlehampton town centre earlier this year will appear in court as his trial begins. The case is set to start on Monday at Lewes Crown Court, after the incident that happened on Wednesday, March 28. Police were called to reports of a stabbing in Terminus Road, Littlehampton, at 2.45pm, and cordoned off the area. A 17-year-old boy and a 16-year-old boy suffered serious injuries after being stabbed, and had to receive hospital treatment, according to Sussex Police. A third victim, a 16-year-old boy, had minor injuries. A 16-year-old was arrested the same day and later charged by police. The teen, who cannot be named for legal reasons, remained in custody and appeared via videolink at Hove Crown Court in Lansdowne Road, Hove, at 2pm on May 3 for a pre-trial preparatory hearing. He pleaded not guilty to two charges of grievous bodily harm with intent and one of attempted grievous bodily harm. Wearing a grey sweatshirt and jogging bottoms with rosary beads and a crucifix around his neck, he spoke only to give his pleas, and to tell the court he could hear the proceedings through the video connection. Click here to read what Sussex Police is doing to prevent youth crime.